Knowing how to resign from a job properly and professionally allows for a smooth exit from the company. These eight key steps explain exactly what to do when you resign and your rights and obligations to your employer. The sample resignation letters can be adapted for your own use. Once you have made the decision to resign from your job you need to organize your departure in a polite and business-like manner. A properly managed resignation means that you leave behind a good impression. 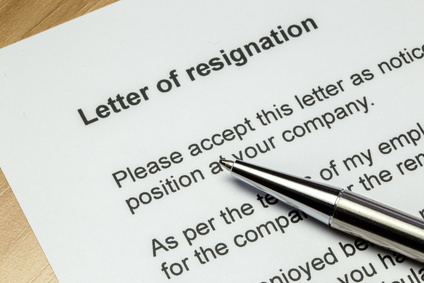 Follow these 8 steps to resigning from a job and keep it professional. 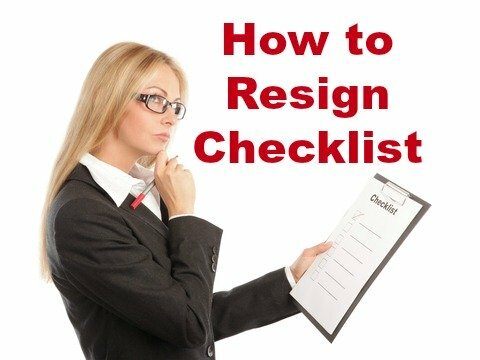 Find out how to resign properly and what to do after resigning. Follow your contractual obligations with regard to notice period. Two weeks notice is the standard notice period however you must abide by the notice period stated in your employment contract or any union agreement that you fall under. If your employer asks that you stay longer than the required notice period you are under no obligation to so so. Your employer must accept your resignation as long as you have given it in accordance with the terms of your employment contract. Make sure you know who your resignation letter should be addressed to and who else in the company must receive copies (usually Human Resources and Payroll). Always keep a copy for yourself. Hand the letter personally to the relevant staff member on the day you write the letter. It can be left unopened in the in-tray or on a desk if not handed directly to an individual. This can lead to problems about when you actually resigned and whether you have given the required notice. If you have resigned by email follow up that it has been received by the right person. Organize a handover period if necessary. Try to complete assignments before you go and leave information easily accessible by your replacement. Agree with your employer how and when to tell your colleagues about your resignation. Sending a farewell email out is one of the best ways to do this. Confirm the payment of any outstanding monies for unused vacation time that you have accrued. Confirm any outstanding payments for overtime, bonuses, expenses. Find out the company policy on unused accrued sick leave. Generally this is not paid out but ask Human Resources what the organization does regarding this benefit. Schedule a consultation with Human Resources or the relevant individual to discuss your insurance benefits including medical and dental, life insurance. Find out about converting or continuing your life and health insurance benefits. If necessary check with your Sate Department for Labor for clarification. Make any outstanding benefits claims. Find out what happens to your pension plan. Some plans provide for a lump sum distribution when you leave the company. The purpose of an exit interview is to address any questions, comments and concerns regarding your period of employment at the company. Use it as an opportunity to give positive feedback where relevant and provide constructive comment on areas for improvement. Use the list of exit interview questions to help you prepare for the exit interview. Don't wait to ask for a reference when you next need one, get the reference while your employer still clearly remembers you! Use the job reference letter to request a reference. Think ahead and make sure you leave the company with at least one employment reference. inform Human Resources of the correct address where any relevant documents or mail can be forwarded to you when you have left the company. make sure your company computer files and email accounts are appropriately closed before you leave. hand back security and parking passes and any other company property such as uniforms, computers, phones. remove all personal items and personal files from your work space.